In early 2017 we added a Long-Term GCE Data page on the private GCE website to highlight our long-term data resources and help GCE researchers prepare for writing the GCE-IV renewal proposal. This page provides links to summary tables and comparison plots to simplify discovery of long-term data sets and help visualize key long-term data trends (see this article from March 2017 for more information). We have continued to collect data since this tool was added, though, and some of the plots and file links were becoming out of date. We have now updated all plots and data set links to include the latest GCE monitoring data, with most variables plotted through 2017. 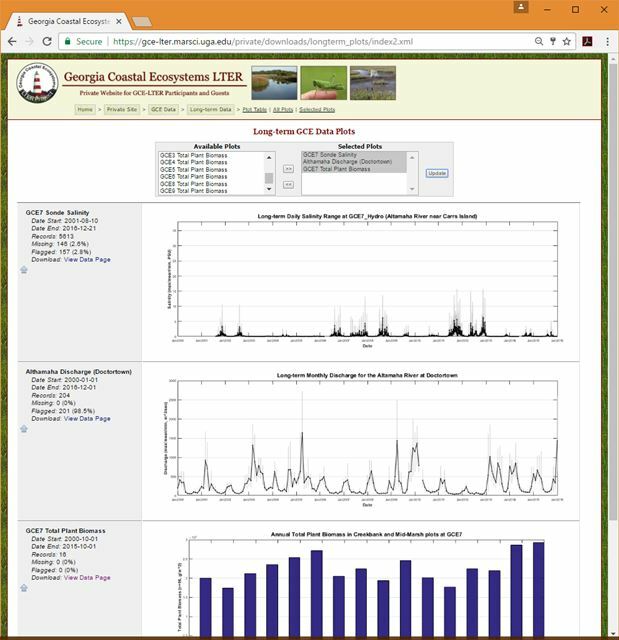 We will continue to update this resource on a semi-annual basis as new monitoring data are added to the GCE Data Catalog and Data Portal.